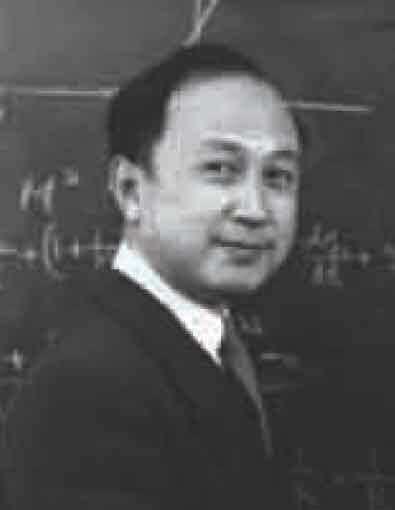 Chinese-born Tsien Hsue-Shen (brilliant Cal Tech student, aerospace pioneer Theodore von Kármán colleague, commended by the U.S. Air Force for his contributions to its technological development after World War II, awarded a Robert H. Goddard Professorship of Jet Propulsion) was accused of harboring Communist sympathies and stripped of his security clearance that originated from his request to Cal Tech President Lee DeBridge in 1950 to visit (along with their grandchildren) his elderly parents in China. Word was given to then Assistant Secretary of the Navy Dan Kimball of Tsien's openly made request. 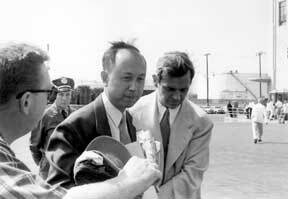 Kimball felt that it was a little risky for him, Tsien, and for the U.S. to have Tsien back in China. Somebody took Dan Kimball's remark seriously and said, "We've got to stop him." How were they going to stop him? Dan Kimball was shocked at the action of the Immigration Service to detain him and angry that his passing remark had been taken seriously. DeBridge commented that "the way they found out to stop him was to charge him with having been a Communist. They found there was a little Communist group here in the thirties. When Debridge was asked if he thought Tsien was framed, his answer was the following: "Yes. I had no reason to doubt it, because we found out during the McCarthy days that two or three Caltech graduate students and others were involved. It was really a small Communist group." Tsien Hsue-shen was born in the eastern Chinese city of Hangzhou. He left Hangzhou at the age of three when his father obtained a post in the Ministry of Education. In August of 1935 Tsien Hsue-shen left China on a Boxer Rebellion Scholarship to study at the Massachusetts Institute of Technology. In 1936 Tsien Hsue-shen went to the California Institute of Technology to commence graduate studies on the referral of Theodore von K¨¢rm¨¢n. Tsien obtained his doctorate in 1939 and would remain at CalTech for twenty years, ultimately becoming the Goddard Professor and establishing a reputation as one of the leading rocket scientists in the United States. During World War II he worked with the U.S. military ballistic missile program as a designer. After the war he served in the United States Army as a Lieutenant Colonel. Tsien Hsue-shen was sent by the Army to Germany and was part of the team that examined captured German V-2 rockets. In 1945 Tsien Hsue-shen married Jiang Ying, the daughter of Jiang Baili - one of Chinese nationalist leader Chiang Kai-shek's leading military strategists. Tsien's version of his association with that group was as follows. When this charge was first brought up, he came in to me and said, "I don't understand this." DeBridge said, "Well, did you have any connections with a Communist group?" Tsien said, "Well, there was a group of people here that had social gatherings. When I came over to this country, a stranger, two or three of these Caltech people invited me to their house for a little social gathering and I went several times." Tsien said, "I guess there was some talk about politics; but it was mostly just talk about general things, and I regarded them as purely social events. I certainly didn't sign up in any way with any Communist Party. And I didn't even remember the word "Communist" being mentioned at these affairs." But somebody had written down on a piece of paper the names of the people who had attended one of these meetings, and this was later brought into evidence. I think there was a typewritten list, and over at the side was written "Tsien." Well, that killed him. He had been back to China once before  and returned to this country. And apparently the standard procedure when you came back to this country was to answer the question, "Have you ever been or are you now a member of the Communist Party?" And of course, he wrote "No." So the charge was "perjury." This was based on the accusation (based on the above-listed typewritten list) that he had been a member of this Communist group but when he reentered the country he had said he had not been. INS impounded his luggage and charged him with concealing classified documents-the most "secret" of which, suspected of containing security codes, turned out upon inspection to be a table of logarithms. In the meantime the FBI had "decided" that Tsien posed a security risk and imprisoned him in San Pedro. They placed him in a detention center that consisted of a little cubicle - a room that had desk with a light and a bed. But for him to be detained that way was a terrible blow to him to his ego and his self-respect. He had served this country well, then to be treated in this way. It made him, eventually, very bitter. He obtained his PhD from Caltech in 1928 and joined the Caltech faculty thereafter, where he became one of the nation's pioneers in aerospace research and development. Millikan served as director of the Guggenheim Aeronautical Laboratory at the California Institute of Technology (GALCIT) from 1949 until his death in 1966 and was advisor to various governmental committees during and after World War II. He was freed two weeks later after Caltech president Lee DuBridge, among others, flew to Washington to intervene on his behalf. INS ignored a barrage of protests colleagues in academia, government, and industry to place him under a delayed deportation order. For the next five years he and family lived under U.S. government surveillance and partial house arrest/parole (under the supervision of Clark Millikan) - but he could not leave Los Angeles County without permission. He was put on parole under the supervision of Clark Millikan, who had to swear that he would report if Tsien left the county. It was a very humiliating experience that made him very bitter and anti-U.S. In September 1955, they were permitted to leave for China. As a result, Tsien concluded that he had become "an unwelcome guest" in the country in which he had spent his whole scientific life. In his determination to avoid such problems again, he deliberately left all of his research notes and papers behind when he sailed to China to become "father" of China's missile program, a trusted member of the government and Party's inner circle, and the nation's "most honored scientist." Recently Caltech decided to offer Tsien the Alumni Award, and he said he could not come. He stated "The reason I can't come is because I'm still under a deportation order. If I were to come back to the United States, I would assume that that deportation order would be brought out, and I would be excluded." The Scientist's Job - Lee A. DuBridge declared in 1947: The first responsibility of the scientist or engineer is to be a good scientist or a good engineer. It is not the job of the scientist to be primarily a politician, a sociologist, a military leader or a preacher. Passage of a number of laws, including McCarran-Walter Act and Refugee Relief Act, contributes to increase of Chinese population in L.A.. Military experience and college education, made possible by various G.I. bills, help Chinese move into mainstream of American life. Before 1952, no Japanese American had ever won an Olympic gold medal. At the 1952 Summer Games in Helsinki, three Japanese Americans won gold medals (Tommy Kono/Japanese American weightlifter, Yoshinobu Oyakawa/won a gold medal in swimming) and Ford Konno won two gold medals in swimming. Evelyn Kawamoto became the first Japanese American woman to win an Olympic medal. DAHLIP SINGH SAUND - ASIAN INDIAN IN CONGRESS! In 1952. he became the first Asian American and the only Asian Indian to have ever been elected to Congress from a mainland state. His famous and immortal quote is "There is no room in the United States of America for second-class citizenship." On April 17, 1952 - The California Supreme Court declared unconstitutional the state's Alien Land Act in Fujii Sei vs State of California. The 1913 law had been used to prevent Asian immigrants from owning property, regardless of their length of residence in the United States. The Japanese American Citizens League lobbied to place a measure on the general ballot to repeal the Act. It won by popular vote on November 6, 1956.
overall limit of only 2,000 immigrants per year from the region defined as "The Asia-Pacific Triangle." Filipinos were allowed the more liberal 2,000 per year quota. The Act's primary benefit to Asian Americans was making Japanese- and Corean-born immigrants eligible for U.S. citizenship. It reversed the The National Origins Act of May 26, 1924 which had excluded immigration of all Asian laborers with the exception of Filipinos who were considered U.S. colonial subjects. It also reversed the Supreme Court's November 13, 1922 opinion in Takao Ozawa vs. U.S. which upheld denial of citizenship to a U.S.- educated, 20-year resident on the grounds that Japanese are neither white nor African. Sumitomo Bank of California is chartered to serve Japanese Americans. During the Korean War (1950–1953), Japanese Americans, including many Nisei veterans of World War II, report for active duty. Among those are several hundred MIS members, who are dispatched to the frontline units to perform intelligence work. Post-Korean War After the Korean War, MIS members serve in various capacities all over the world. Some stay in Japan for years, working in the U.S. military, American government service, or in private industry. Others return to the United States having been discharged from the army to restart their lives. Japan signs the peace treaty with the United States and 47 other nations. U.S. Congress passes the McCarran-Walter Immigration Act, granting Japan a token immigration quota and allowing Issei to become naturalized citizens. MISLS instructor John Aiso becomes the first Japanese-American judge on the mainland. California Governor Earl Warren appoints John F. Aiso of Los Angeles to the court, where he becomes the first judge of Nisei origin on the mainland. The Chinese Chamber of Commerce was established in 1955 by a group of Chinese business people to promote and encourage the development of the Chinese-American business community throughout the Greater Los Angeles area. The Chamber acts as a strong influence for positive action on key legislative and regulatory issues affecting the Chinese business climate and community. The organization provides a forum for the Chinese and Greater Los Angeles business communities for discussions on issues relevant to both groups. In addition to serving as an advocate of the Chinese business community, the Chamber promotes cultural awareness to improve inter-ethnic relations by organizing events, such as the historical tours through Chinatown, Chinese New Year Golden Dragon Parade and Miss Los Angeles Chinatown Beauty Pageant. This act permitted residents of the Asian Pacific On June 30 - James Jang (father of pianist Jon Jang and a 5-foot, 2-inch former Boy Scout and amateur magician) was a passenger on on one of the plances that was involved a spectacular midair collision that was the worst commercial aviation accident at that point in the country's history that revealed a dangerously antiquated air traffic system. Aviation historians would later write that the effect of the Grand Canyon disaster was "as galvanic as if it had happened over Washington itself." Congress would allocate $810 million to buy navigation equipment and long-range radar, and begin a sweeping reorganization of the nation's fledgling aviation system. The Federal Aviation Administration was created out of the ashes of this Grand Canyon crash that involved Trans World Airlines Flight 2 to Kansas City, MO. and United Airlines' Chicago-bound Flight 718. This act permitted residents of the Asian Pacific Triangle to enter the United States as quota immigrants, which resulted in heavy emigrations from Korea, Taiwan, Hong Kong, and Indochina. Further legislation after the war had created an immigration system that aided family reunification and created preferences for immigrants with good educational backgrounds. Harry Holt, a resident of Oreswell, Oregon, returned from Korea with eight Korean orphans, whom be adopted. 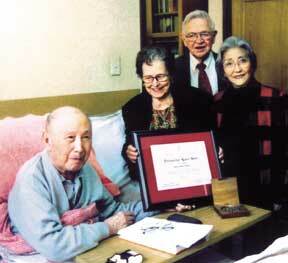 He later established the Holt Adoption Agency, which brought thousand of Korean orphans to the United States. Chen Ning Yang and Tsung Dao Lee win the Nobel Prize in Physics. Immigration and Nationality Law was amended to further limit the ability for "aliens" (born in the US or naturalized) to become citizens of the US. In a dream sequence that recurs throughout the 1987 movie "La Bamba," two planes fly over a schoolyard where youths play basketball in slow motion. The planes collide, explode and shower wreckage across the school and neighborhood.Th e 1957 midair crash was the catalyst for new laws restricting test flights over populated areas and for a new statewide school disaster plan. At least one student developed an intense fear of flying after the accident: 15-year-old Richard Steven Valenzuela, who soon became known as singing star Ritchie Valens. Valens "wasn't even at school that day," recalled Bill Frazer, 63, of Mission Hills, who was in the auditorium practicing for his ninth- grade graduation when the planes hit. Valens was at his grandfather's funeral. Two years later, Valens, Buddy Holly and the Big Bopper (J.P. Richardson) died in an Iowa plane crash. The event became known as "the day the music died" in Don McLean's 1971 hit "American Pie." DETAILS On Jan. 31, 1957, a clear, crisp Thursday morning, twin Scorpion fighter jets from Northrop's Palmdale facility engaged in routine "scissors interceptions" — first one plane, then the other, served as a target to test radar equipment. At 11:18 a.m., one moved into a wide turn 25,000 feet above the San Fernando Valley. As it completed the turn, the jet slammed into the wing of a DC-7B transport plane returning to Douglas Aircraft's Santa Monica plant on a routine test run. The Scorpion burst into flames. The pilot, Roland Earl Owen, 35, of Palmdale, went down with the jet in La Tuna Canyon; the radar operator, Curtiss A. Adams, 27, parachuted to safety. "Uncontrollable, uncontrollable … midair collision…. We are going in…. We've had it, boys. I told you we should have had chutes." A brief silence, then: "Say goodbye to everybody." The remains of Carr, Twitchell and the other crew members — radio operator Roy Nakazawa, 28, and flight engineer Waldo B. Adams, 42, both of Los Angeles — were found in the fuselage, which smacked into the ground at Pacoima Congregational Church, adjacent to the school. Part of an engine crashed through the roof of the church auditorium, smashing windows and destroying that building. Confession Program pardons undocumented Chinese immigrants. On August 21, 1959 - Hiram becomes the first Asian Pacific American to be elected to the United States Senate. His political career spanned over thirty years and he retired in 1977. At that time Fong was already one of Hawaii's most prominent citizens and successful businessmen. After graduating from McKinley High school and the University of Hawaii, he worked for several years to save money to attend Harvard Law School from which he graduated in 1935. After working as a Honolulu deputy city attorney and founding a law firm, Fong won a seat in the Territorial House of Representatives in 1938 at the age of 31. He went on to become a Speaker of the house who was popular with both Democrats and Republicans. Through the years he has received 11 honorary degrees and many other national and international awards. Daniel Inouye & Spark Matsunaga are elected to Congress from Hawaii. Inouye is the first congressman of Japanese descent to be elected. Wilfred C. Tsukiyama becomes the first Chief Justice of Hawaii's Supreme Court. Which act performed the most on The Ed Sullivan Show - the Kim Sisters, who performed 22 times within a 14 years period. Imagine a Korean sister act capturing the heart of American pop culture by singing "You Ain't Nothing But a Hound Dog". It may sound far-fetched today, but that's exactly what America was seeing on the Ed Sullivan show in 1959. The Kim Sisters were Sook-ja (Korean), Mi-a (Korean) and Ai-ja Kim (Korean). They started their career as the entertainers, singing for U.S. troops in Korea in 1954. They were the three of the seven children of Kim Hae-song (Korean; 1911 - 1950), a classical music conductor and popular composer who was captured and killed by the North Koreans during the Korean War, and Lee Nan-Young (Korean, 1916 - 1967), one of Korea's most famous singers before the World War II, best known for her 1935 nationwide hit song, "The Tears from Mokpo." Lee had been singing for the foreign troops, to earn enough money for them to survive, when one day she got the idea of having three of her daughters sing, too. The girls did not know English at that time, so they learned the songs phonetically. Just 13, 12 and 11 years old at the time, the first song they sang was the Hoagy Carmichael's "Ole' Buttermilk Sky." The show went well and soon the sisters were singing regularly, all the popular music and early rock'n'roll of the day. Soldiers would give them chocolate bars, which in turn they would trade in for real food on the black market, but it was enough to get by. In 1958 they were discovered by an American agent who booked them into the Thunderbird Hotel in Las Vegas, as part of a show called the China Doll Review. The three of them earned $400 a month. After a month at the Thunderbird, they were picked up by another Vegas hotel, the Stardust, where they played for eight months. In 1959 they got their big break when they were asked to play on the Ed Sullivan Show and being on his show made the Kim Sisters a nationally known act. Kim Sisters on the "Hollywood Palace"
Over the next 14 years, they would perform on Ed Sullivan 22 times, the most of any performer who appeared Ed Sullivan show. They were featured in LIFE and NEWSWEEK and other magazines. Far from singing for chocolate bars, the Kim Sisters eventually were making around $13,000 a week. They kept performing in Vegas and elsewhere for years, although after they got married in the 1970s, the act pretty much came to an end. Ai-ja died in 1987 of lung cancer, but they other two sisters are still alive and living in the United States still. The Kim Sisters, composed of three sisters, Sook-ja, Ai-ja, and Mia, came from Korea to Las Vegas in February, 1959. Their first contract in American was to perform at the Thunderbird Hotel for four weeks as part of the China Doll Revue, the main showroom program. This engagement led them to a successful career. Their popularity was at its height at the end of the 1960s, when they performed throughout the United States and Europe. Copyright © 1996-2010 - Asian American Artistry - All Rights Reserved.